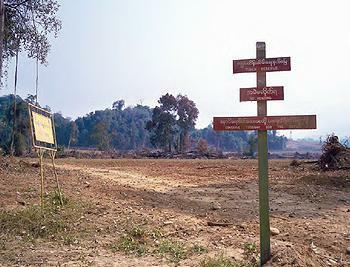 Here we go again with decimating more of the tiger's population by taking away available land where they can survive. Sorry Simone.... I couldn't seem to get into the site to find out more. I couldn't quite make out what was going on. Does it mean that the creation of a tiger reserve was just a piece of fiction? This is just another unbelievable bit of terrible news for the Tigers. It is hard to believe they could do such a thing. This makes me feel so ill. It's hard to read stories like this and not give up. It seems greed and human interest will always win out... until we've driven ourselves to extinction. Link is to another matter entirely. Protest in our own counrty! Myanmar governments are anyway total dead=beats - control freaks as proven during the last disaster when they did not allow any foreigners to help out their counrty and rather seeing their own people suffer - but they surely took our donations! Bastardly old men that should be removed. The Link is wrong and I can't get to the Tiger story. When I clicked on the link it didn't take me to the page. How do I read the whole thing? The link is misdirected to another, also important article. I grieve for the tigers. Greed will kill us all. We are Atlantis. The link is wrong, and I can't reach the story about the tigers. But it seems as though some greedy humans have once again taken land that was supposed to be set aside for the tigers and used it for other purposes. Wrong, wrong, wrong! When are the tigers going to win???? Noted with great sadness. The day will surely come when Tigers will be a thing of the past - if greed is allowed to win!!! I, too tried to visit the website but got a Greenpeace article instead. I don't see anywhere to sign petitions, either (would do for Greenpeace, too!). PEOPLE YOU GET THE LINK BY GOING TO THE WORD "SEARCH" on the Greenpeace Chevron article-- its near the top among other single headings-- type in Tiger -- then the article comes up. (the website must be putting up its latest stuff all the time). This is so sickening and heartbreaking. Its as if they are killing the tigers twice over. I suppose its what we would expect from Myanmar. Their regime is comparable with N. Korea. Little by little, it all goes away. What will we say, when it is all gone and cannot be replaced? SOYLENT GREEN!!! China is the real one to blame for this degradation, they are the only reason this regime has been able to exist for so long. Money is all that matters to China and whatever it takes to get more and more with no thought of the damage to the planet. Myanmar-evil ....jerks...They have done so much damage to the indigenous people so it doesn't surprise me that they would do this. How sad! Clearcutting is an environmental disaster no mwattr where it takes place. My being from the American West makes me overly familiar with this dubious logging method. It is particularly painful to hear of a wild population whose fate is in jeopardy because of efforts to make a few short-term profits at the cost also of destroying an environment. What possesses people to act to destroy the very world which sustains not only tigers but also all of us? Clear cutting is an environmental disaster no matter where it takes place. Since I am from the American West, I am familiar with this logging method. Hundreds of square miles of formerly forested land have been decimated in the name of greed and short-term profits. In Myanmar, the prospect of clear cutting is particularly painful in view of that fact that it puts the survival of a species of tiger in jeopardy. What prompts humans to act to destroy not just tiger habitat, but the environment which sustains us all? Shame. Another reason to boycott Myanmar(Burma). It is a Country run not only by a despotic regime, but by an utterly corrupt one to boot. I guess I'm a bit confused. If Myranmar is in Burma, how does China get involved? Can one expect anything better from the corrupt dictatorship in Burma? Sbows the rich don't care about anyone but themselves. God will get them for this.